y name is Katy Alexander, and I am fourteen years old. I am fat. I have been fat all my life. It has only been recently, though, that I’ve been able to embrace my bigness. One of my hobbies is drawing. All the people I’d ever drawn before were skinny twigs. Then, a few months ago, I sketched out a person very different from the others I had drawn. She was big. And she was pretty. 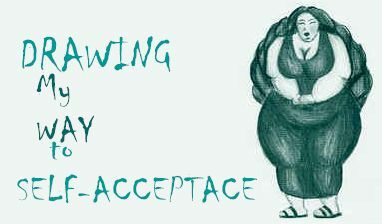 This was a very important step for me in realizing that fat people are beautiful. Radiance has done a lot to reinforce this. Editor’s Note: Katy is now fifteen years old and is a freshman at Squalicum High School in Bellingham, Washington. She lives with her parents, Barry and Cindy, and her ten-year-old brother, Ian. And she continues to draw, beautifully. printed version of the magazine!